I couldn’t possibly finish this series without a nod to Nigella. 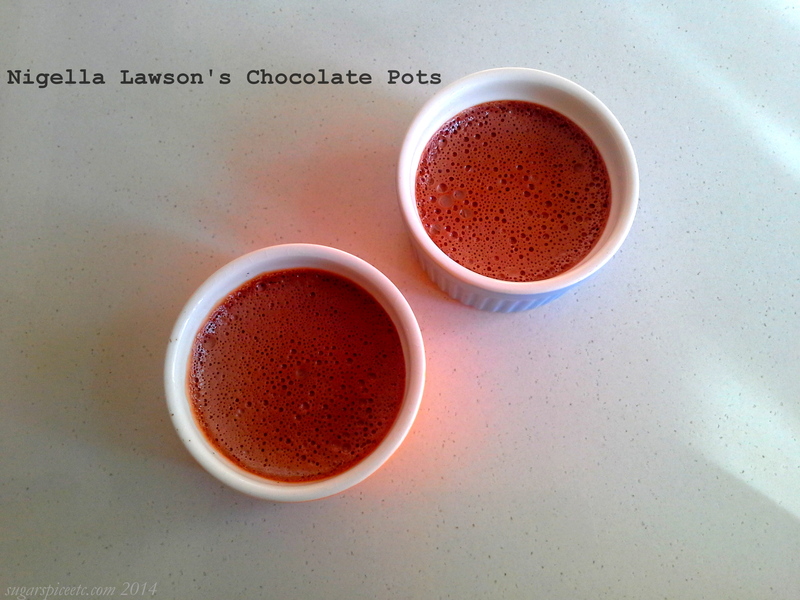 And chocolate pots are easy to prepare, intensely rich and decadent. Of course, you must use the best quality dark chocolate you can find- minimum 70% cocoa solids- and the rest is just a matter of pulsing everything together in the food processor, coupled with patience as the pudding sets. Mine came out with one too many air bubbles, but no matter. It was gobbled up in seconds! In a food processor, blitz the chocolate to shards. Heat the cream and milk together until it almost boils. Pull off the heat, add the vanilla and pour this liquid over the chocolate in the food processor. Allow the mixture to rest for 30 seconds so that the chocolate melts somewhat. Blitz for 30 seconds, then add the egg and process for 45 seconds more. Pour the mixture into ramekins and set for a minimum of 6 hours to overnight. Take them out of the fridge and allow them to rest at room temperature for 15 minutes before serving. I made her ‘Rum Butter’ (to go with a shop-bought pudding) and her Chocolate Guinness Cake (both from ‘Feast’) to take to friends today for Christmas Dinner. Both went down a treat.